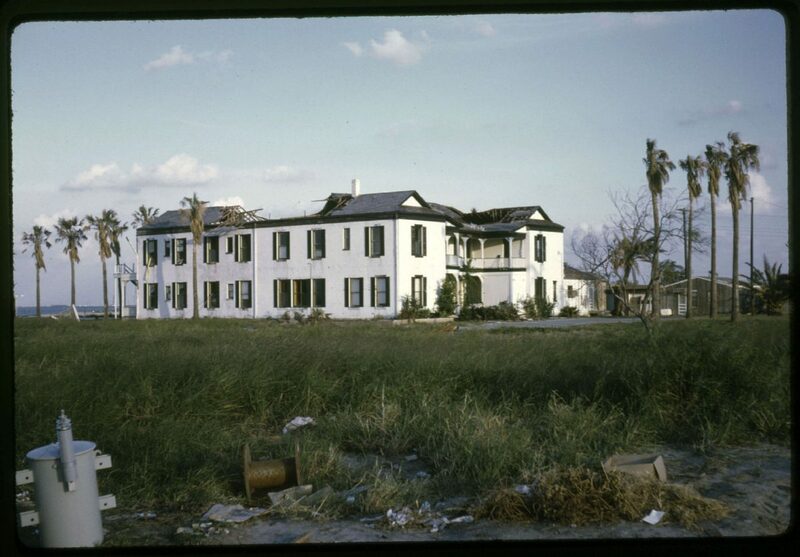 Fifty years ago today, as Hurricane Beulah made landfall near Brownsville, Rio Grande Valley residents relied on the reports and observations of the National Weather Service’s bureau in Brownsville. Even though the bureau lost power and was in the path of the storm’s strongest winds, they continued to provide advisories throughout the day until the storm moved north of the Valley late in the day. Below we present abridged versions of the reports issued Sept. 20, 1967, by the Brownsville office. Hurricane Beulah apparently has turned to a more northerly course and it appears now that the center will pass just east of the mouth of the Rio Grande and thence northward along or just offshore of Padre Island. We have lost power to our tide gauge at South Padre Island and no tide observations are available. Two hours ago the tide there was 2.5 feet MSL, which was about 2 feet above normal. Hurricane Beulah is about 45 miles southeast of Brownsville and moving toward the north northwest about 12 mph. It is expected to pass just off the mouth of the Rio Grande in about four hours. Hurricane winds are being experienced at Brownsville with velocities around 70 mph and the highest gust so far has been 104 mph. Hurricane Beulah is extremely dangerous and continues to batter the Brownsville-Port Isabel area. Highest gust as of 5 a.m. has been 109 mph. At present, pressure continues to fall rapidly and was 28.72 inches at sea level at 5 a.m.
At 5 a.m., Beulah was located about the vicinity of the mouth of the Rio Grande. At 7 a.m. the center of Beulah was located by the Brownsville radar about 16 miles northeast of Brownsville. Brownsville winds continue from the north at around 45 mph. Brownsville recorded 1.05 inches of rain since midnight. Although this will be official, it is considered a poor sample because of the strong winds prevailing during the period prevented an accurate catch of rain. The barometric pressure at Brownsville is 28.21. It is still falling. The highest wind observed ahead of the storm was 109 mph. Brownsville radar indicates the hurricane center about four miles east of San Benito, northeast of Brownsville, and moving toward the north northwest at about 12 knots. Brownsville wind is south southwest 50 knots with gusts to 85 knots; rain squalls continue. Lowest barometer was 28.05 inches and occurred at 8 a.m.
Hurricane Beulah is located a short distance east of Harlingen and is moving north northwestward about 10 mph. Hurricane winds will continue in the Harlingen area for another hour or two then gales for another three or four hours. Hurricane Beulah is located about seven miles north of Harlingen and continues on a slow northwesterly path toward Willacy County. Hurricane force winds continue in the Brownsville area as winds are currently south southwest at 58 mph gusting to 76 mph. Heavy rain squalls in the Lower Valley will cause local flooding for the remainder of the afternoon. 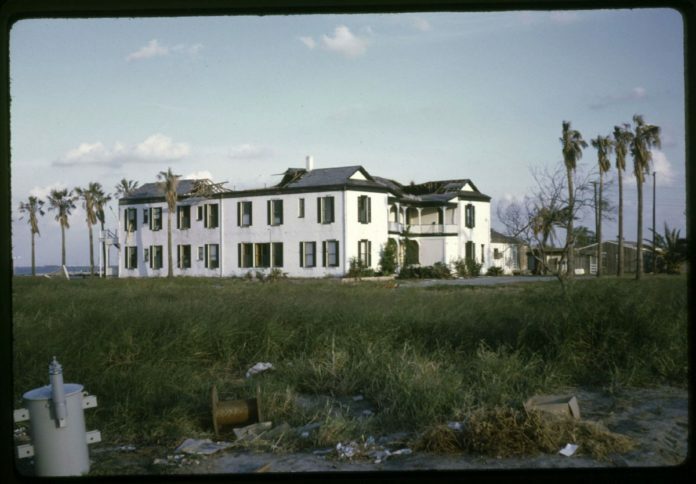 At 3 p.m., the eye of Hurricane Beulah was located 9 miles north northeast of Raymondville. Wind at Brownsville was south southwest at 48 mph with gusts to 69 mph. Rain is heavy but amount is not available due to danger to personnel in making a reading. Inside recorder is inoperative. All communication facilities except short wave radio is inoperative. At 5 p.m., the eye of Hurricane Beulah was centered 28 statute miles north northwest of Raymondville as located by Brownsville radar. It is moving to north northwest at 11 mph. Spiral bands of rain squalls extend from the center south and west across the Lower Valley into northeast Mexico. The wind at Brownsville currently is south southwest with gusts over 60 mph. Heavy rain continues. At 7 p.m., the eye of Hurricane Beulah was located by Brownsville radar about 32 miles south of Kingsville and moving northeast at 2 mph. Heavy rain continues at Brownsville. Wind is south southwest at 35 mph with gusts to 53 mph. Communication facilities remain inoperative except Ham radio.